This sleek new addition to the Chelsea dining scene is only two weeks old, yet already it’s attracting hungry hordes of excited locals. Come in around lunch, the general manager told us, and you’ll find a line winding down the sidewalk. (Thankfully, the interior is quite spacious and does not lack for available tables.) And no wonder, I thought as I sat myself down at the table made of refurbished bowling alley planking, the tantalizing scent of warm home-made pita, laffa bread, along with a faint hint of spices emanating from the two taboon ovens behind the counter would draw me here from a mile away. Ordering is simple – pick a main dish and then choose from a mind-boggling array of freshly made toppings. Every order comes with a generous serving of the eponymous (and incredibly creamy) hummus. What stood out to me first was the pita. Fresh from the oven, golden and crisp on the outside, soft and fluffy within; it was warm, floury quintessence. It took a lot of willpower to put it down in order to try everything else on the table, but it was well worth the effort. The steak, roasted in the taboon upon skewers, was tender, with just enough seasoning so as not to overwhelm the taste of the fresh beef. For vegetarians, the falafel is phenomenal, much better than anything I’ve gotten off of a halal cart or at a chain store. Handmade from local ingredients, just like everything else on the menu, they are crisp without being oily. Topping it off with a generous dollop of the thick, creamy tzatziki sauce, beets, chickpeas, corn, and israeli salad (cucumber, tomato, and parsley) and I was in falafel heaven. Other standouts from the menu include the Mediterranean rice and Israeli couscous, buttery and rich; the Spanish eggplant, a whole bowl of which I scarfed down within 30 seconds; the moroccan red bean soup, perfect with the brown rice; and the vegetarian stuffed grape leaves. By the time my friend and I had worked our way through our meal, we were feeling incredibly full. But then we saw the baklava and the rugelach. How could we resist? Never having had rugelach before, I enjoyed the moist, creamy pastries. However, the baklavawas the true piece de resistance. Between three layers of incredible melt-in-your-mouth-thin crispy dough was a satisfying, nutty paste, just sweet enough so as to not overwhelm my tastebuds and delicately spiced with cinnamon and garnished with finely chopped pistachios. So if you’re looking for a quick bite of Middle-Eastern food, the Hummus and Pita Co. is worth a visit, especially for the variety of toppings that you won’t get anywhere else. And if you’re a little chary about waiting in line, go in when they’re less busy and ask the super friendly servers for a few pitas and a container of hummus to go. That’s what I’ll be doing every time I’m in the neighborhood. 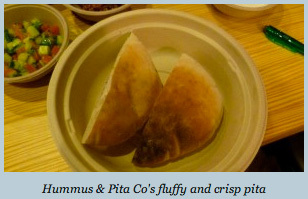 The Hummus & Pita Co. 585 Avenue of the Americas. (212) 510-7405. 1 to 18th St. Mon-Thurs: 11AM-10PM, Fri-Sat: 11AM-11PM, Sun: 11AM-9PM. $5-$9 for sandwiches.